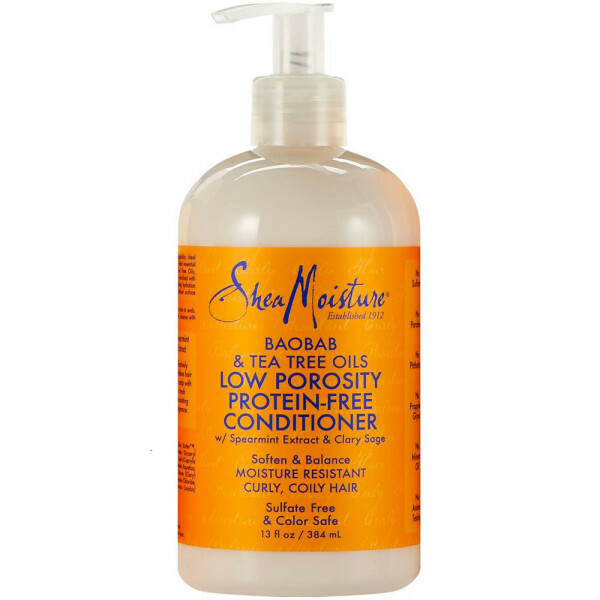 SheaMoisture Baobab & Tea Tree Oils Low Porosity Protein-Free Conditioner is a lightweight conditioner that softens and improves manageability. Ideal for low porosity curls and coils that resist essential moisture. Infused with fast-absorbing Baobab and Tea Tree Oils to promote scalp health, and enriched with certified organic Shea Butter for nourishing and balanced hydration that reached beyond the outer cuticle layer. Refreshing Spearmint invigorates the scalp for a stimulating experience, while Clary Sage gives hair a silky shine. • Baobab Oil is extracted from the African “Superfruit”. This deeply moisturizing oil is rich in vitamins and antioxidants. • Tea Tree Oil moisturizes and soothes for lasting scalp comfort and healthy-looking hair. Apply to freshly shampood hair. Leave on for 3-5 minutes. Rinse thoroughly.